We’ve met with the winners of the first University of Brighton digital award competition, had photos taken with “Big Cheques” from Santander and discussed their plans. We used the Jisc Elevator platform to run the competition and modelled it on one of the best things I’ve seen Jisc do: the Summer of Student Innovation, SOSI. -that students are often in a better position to point out how and where things can be made better in Uni life, and maybe are even best placed to create the solutions in terms of available time, energy and motivation. Our Digital award extended the eligibility to University of Brighton staff as well as students, and asked them to submit ideas as elevator pitches explaining how technology could improve some aspect of Uni life. 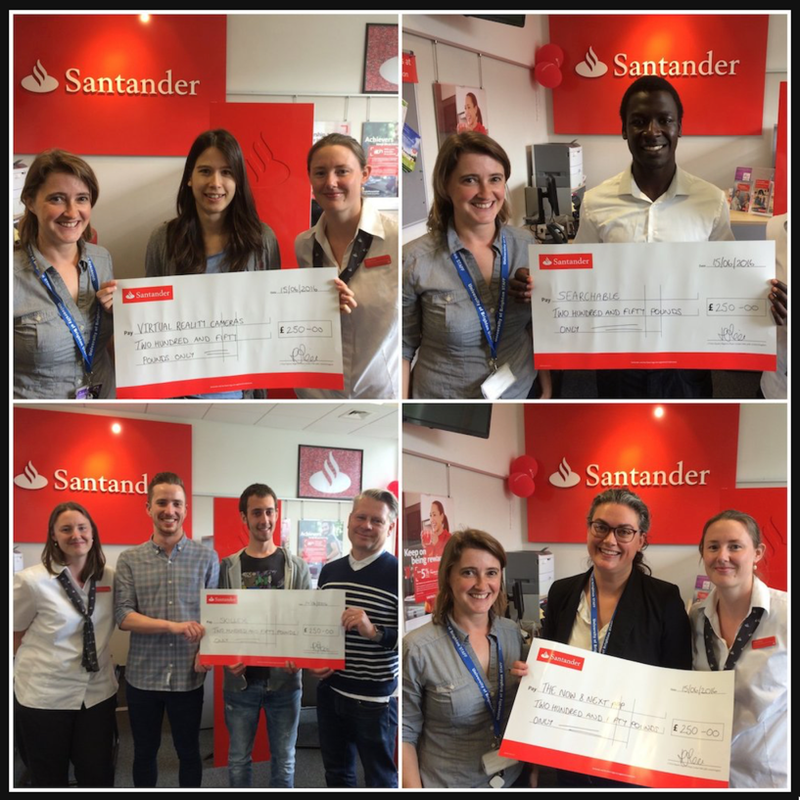 We have £5k funding from Santander Universities, who do lots of these sort of interventions in their host Uni’s, the University of Sussex up the road did some useful work on accessibility with their award. Running the Elevator tool was relatively easy, where we needed a bit more work was in publicising the competition. Our Internal marketing have a lot of requests to provide information to students, and it’s easy to get lost in the flow. To try and raise our profile we publicised the competition with an “Elevator” based marketing campaign… as I liked the idea of an elevator in an elevator… This worked reasonably well, at least in terms of the posters “rip offs” being removed and replaced. We used the ubiquitous display screens across the University, and encouraged the use of social media. We had 15 cracking ideas, which attracted 864 votes, a shed load of tweets, Linkedin and Facebook mentions. The top 4 ideas, the #4brightideas each got £250 prize money, and access to a further £1000 to help build prototypes and whatnot. Robert Otim, a BSc (Hons) Product Design final year student, submitted “Searchable”, a smartphone application designed to help students locate available computers based on their software requirements. Robert’s idea lines up with a current project to deploy “myPC” to help folk book computers. Robert has graduated and before he gets snapped up by an employer will be developing the design of the “searchable” location maps for us. Poppy Mosbacher, is an MA in Sustainable Design student, who submitted “Virtual Reality Cameras”, and has a busy Summer planned taking a robot elephant to Glastonbury. Her idea is to build a 3D scanner with up to 40 raspberry pi cameras taking photos from all angles of people or objects such as architect models. She’s working on the framework, whilst we try and find a source of 40 pi zeroes. Clare Griffiths, Business Development Manager in Student Services submitted “Now & Next”, a web-based app for students and graduates, which helps users develop their skills and find employment. She’s off to talk to a local app development company run by University of Brighton Alumni, about building a prototype skills audit. Lorenzo Ferronato, Mark Joste and Calvin Molloy are MSc User Experience Design students, and their idea is “SkillEx”, a place for discovering skills, exchange knowledge and promoting collaboration between students and between staff. Their next step is to gather user requirements, and they’re hoping to interview a cross section of staff and students over the Summer. We’ve arranged follow up meetings with each of our winners, and will record the progress of the projects on our team blog here. University of Brighton Learning Technology Advisor, Robot Builder, Allotment keeper, Cheese lover.